It's been quite the a month or so for Marvel Studios-kicking things off with what feels like the ramp-up for their first film of 2019 with the much anticipated, first female-led Captain Marvel and of course following that up with the glorious teaser that finally revealed the title and our first real look at what we now know is Avengers: Endgame. And now, today brings us the first look at what will be Marvel's (in association with Sony, of course) third film of 2019 in the official sequel to 2017's Spider-Man: Homecoming, Spider-Man: Far From Home. Far From Home only just wrapped shooting in October, but while filmmakers and digital effects artists are now able to work almost simultaneously with one another, building sequences that require large amounts of CGI as dailies are being sent to them from set, this did leave one curious as to just how much has been accomplished in the three months of post-production as rumors began to swirl as early as the same week the Endgame trailer dropped that we'd be getting a Far From Home trailer. Sony no doubt wanted to give their animated Spider-Man: Into the Spider-Verse movie time to breathe before reminding people there would be another movie featuring the web-slinger hitting theaters in less than a year and good on them for it as Spider-Verse certainly deserves all the acclaim and accolades it is receiving, but no lie-this looks great and the effects look better than expected meaning we get more money shots here than I thought we might. Given the events of Infinity War and the fact we don't yet know what happens in Endgame it was always going to be a tricky task to market a film featuring a character that supposedly "died" in that movie, but this teaser makes no reference to that seminal work in regards to superhero films, but instead goes one further and confirms Samuel L. Jackson's Nick Fury is also back from being dusted. Jon Watts returns to direct this sequel that will see Peter Parker and his friends, including Zendaya's MJ and Jacob Batalon's Ned, going on a summer vacation to Europe where Peter and co. find themselves in a plot with Jake Gyllenhaal's Mysterio. 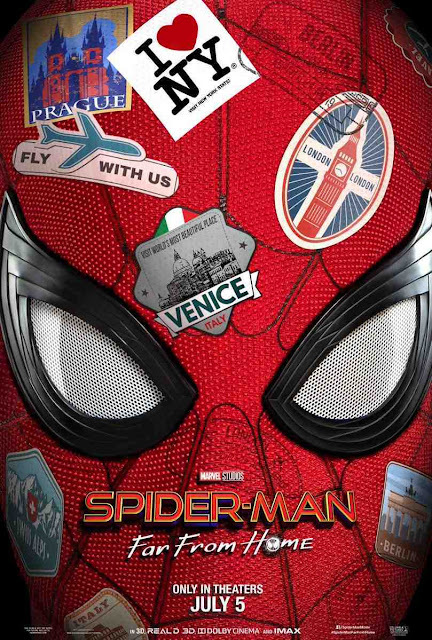 Spider-Man: Far From Home also stars Cobie Smulders, Marisa Tomei, Jon Favreau, Michael Keaton, Angourie Rice, Martin Starr, Tony Revolori, J.B. Smoove, and opens on July 5th, 2019.